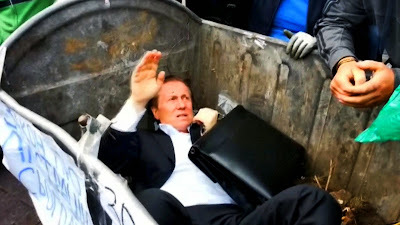 KIEV, Ukraine -- A controversial Ukrainian MP was unceremoniously thrown into a wheelie bin and pelted with rubbish after being targeted by an angry mob. Vitaly Zhuravsky, once a member of former President Viktor Yanukovich's ruling party, was seized as he walked past crowds outside the parliament building in Kiev this morning. The pact would remove trade barriers and mean Ukraine would adopt EU standards in the areas of human rights, security and arms control. Russia has previously opposed the free trade parts of the pact claiming its market could be flooded with cheap EU goods shipped via Ukraine. In response Kiev agreed to delay implementing that part of the pact until 2016 although they will be able to freely export goods to the EU. President Petro Poroshenko called the vote a 'first but very decisive step' toward bringing Ukraine fully into the European Union. He said: 'No nation has ever paid such a high price to become Europeans,' referring to the bloody conflict that has gripped Ukraine since his predecessor, Viktor Yanukovich, walked away from the EU pact last November in favour of closer ties with Ukraine's former Soviet master, Russia. It follows five months of bitter conflict which has left over 3,000 people dead. As part of a peace plan signed with pro-Russian insurgents on September 5, the Luhansk and Donetsk regions which are currently in rebel hands, would be granted 'special status' for three years. The draft proposals, details of which were leaked on Monday to local media, would allow the disputed region to 'strengthen and deepen' relations with neighboring Russian regions. The rebels would be permitted to set up their own police forces, hold their own local elections in November and use the Russian language in state institutions. Fighters on both sides would be granted freedom from prosecution, although Poroshenko insisted there would be no amnesty for those guilty of the most serious crimes. Commenting on his website Poroshenko said the proposals would pave the way for decentralisation while guaranteeing 'the sovereignty, territorial integrity and independence of our state'. The bill permits the regions to 'strengthen good neighbourly relations' with Russia and promises to help restore damaged infrastructure and to provide social an economic assistance to particularly hard-hit areas. 'We will insist that any political unions with Ukraine are not possible now in principle,' Purgin said, renewing charges against the Ukrainian military of violating the Sept. 5 truce. No breakdown of the parliamentary vote was given after the closed-door session. The cease-fire declared on September 5 had appeared to be holding up, but fighting broke out again over the weekend resulting in six deaths and a team of international monitors being shelled. The fighting has reportedly continued throughout Monday and was particularly fierce around the airport and railway station in the industrial city of Donetsk which is currently in government hands. Government forces are said to have suffered heavy casualties which Kiev claims are a result of Russian troops fighting for the rebels. Russian President Vladimir Putin has justified his support for the rebels by claiming Poroshenko has failed to address the grievances of the pro-Russian regions. Some commentators suggest allowing the rebels to forge closer ties with Russia could whip-up opposition within pro-Western factions within Kiev's political establishment. Shelling killed six people and wounded 15 others in the rebel stronghold of Donetsk, the city council said yesterday . Fighting around the eastern city's government-held airport has left its northern neighborhoods in the crossfire. Two northern neighborhoods were shelled heavily Sunday, leading to the casualties and damaging both homes and offices, the city council said. 'Neither today, nor yesterday, nor in the previous days did Ukrainian forces shell any residential areas,' said Col. Andriy Lysenko, spokesman for the Ukrainian National Security and Defense Council. In an interview yesterday, NATO Secretary-General Anders Fogh Rasmussen said that 'around 1,000' Russian soldiers remain in Ukraine. 'While the Russians may have withdrawn some of their troops in Ukraine, there is a still Russian military presence within Ukraine,' Rasmussen said in Brussels, adding that several thousand Russian soldiers were also along the border with Ukraine. Russian President Vladimir Putin and German Chancellor Angela Merkel in a phone conversation on Monday both stressed the importance of observing the cease-fire, the Kremlin said in a statement. She said the complete withdrawal must accompany a securing of the Russian-Ukrainian border to prevent fighters and arms from flowing to pro-Russian separatists in eastern Ukraine.